Stands have telescoping 1.625? diameter poles that extend out, meaning they are adjustable to certain sizes. Stand also includes travel bag. Insert are constructed with pole pockets. 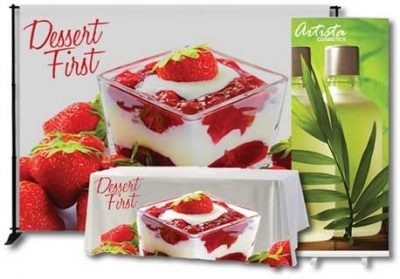 Our table covers are dye sublimated and made from our 8.8 oz. polyester table fabric that drapes over 3 sides of a 72? x 24? x 30? display table. Econo Roll packs great value into an easy-to-use durable and attractive stand. Finished in anodized aluminum and heavy-duty plastic end plates, carry bag is included.